Must Blog ALL OF THE THINGS! Phew, yes, it’s been a crazy couple weeks around here. Busy knitting my rear end off , writing patterns, getting sick, getting well and now nursing sick kids. I need to do a giant blog post of all the stuff that’s been happening. It’s kind of crazy! First of all, I have a sale going on. For those of you who know all about Malabrigo October Stockpile, you know that it’s a great time for all things Malabrigo. The fabulous Mal Junkies group on Ravelry holds the most fantastic events. In honor of this event, I have put everything in my shop at 15% off with the coupon code: ninjastockup . Stop by the Junkies group and join in the fun. There is a thread full of sales postings. Secondly, there is another group doing great things on Ravelry. The Candy Skein Addicts group is running a Rhombi KAL for October-December. I am really honored they liked the pattern so much they wanted to do a KAL. If you haven’t seen Candy Skein yarns, you need to get on over to the group I linked. She has some very lovely yarns. She is offereing $2.oo off each skein of yarn ordered for the KAL. That is a seriously great deal! Check out her lovely stock here and don’t hesitate to ask for a specific color! Now, a little news about the Anonymous Vampire shawlette. It was featured on the Indigodragonfly blog here, recently. I used her Merino Sock in the pattern and it is absolutely wonderful yarn! I love it. So, if you would like to use the same yarn, be sure to check out her available yarn section. it is worth every penny. See my finished shawlette…it had been knit, blocked, frogged and reknit when I decided to make a design change. Yeah, you can’t tell, because the yarn is so AWESOME. 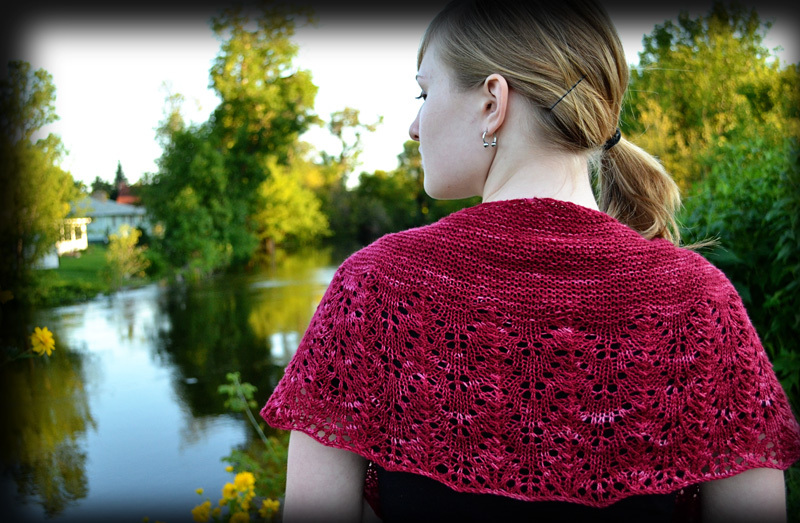 Now, Anonymous Vampire didn’t win the pattern design contest for the Indigodragonfly KAL, but that’s ok! It’s been a big hit and I hadn’t even planned it as a design so it was lots of fun to do. Last, but not least, the Itty Bitty Kiddie KAL is well underway. FO picks are rolling in! I gave away and random skein of yarn last week. This weeks random skein will be Malabrigo Rasta in the Coronilla colorway! So, come by and join in. Post away for the most chances possible! So as not to leave you pictureless, I give you a shot from my photoshoot for my most recent pattern to head to test knitters. I am calling it, “Go Buffalo!” Why? You ask. Well, I am a big hockey fan…and I LOVE the Buffalo Sabres. 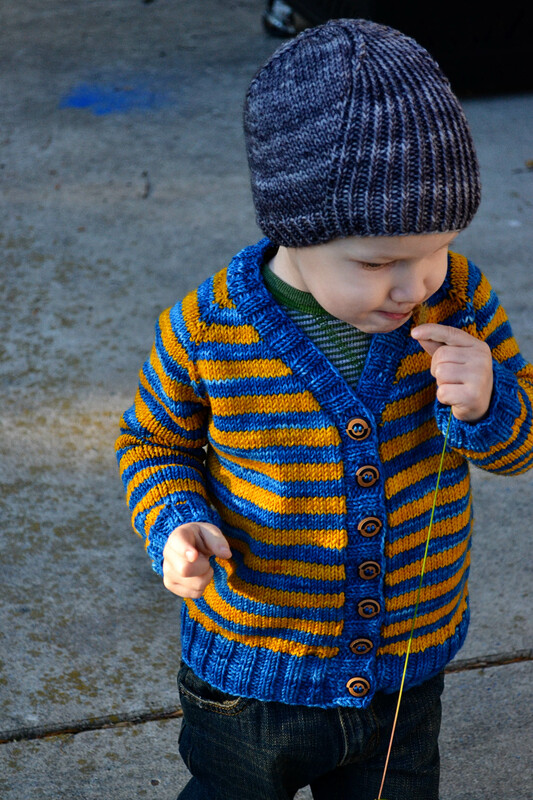 I wanted to knit my son a striped cardigan in old school Buffalo Sabres colors. Since I couldn’t find a pattern that I liked enough to modify. I just made one up and then decided that I might as well grade it while I am at it! I had planned to talk about my finished objects on Friday and then…I got sick. Oh, did I get sick. Not really sure with what but, I was feverish and my tummy was icky. My head was floating somewhere in the vicinity of my body, but I’m pretty sure it wasn’t attached. I was going to show you my Westknits mystery shawl! I did mine in silky Malabrigo. The colorways that I used were Smoke, Cape Cod Gray, and Manzanilla Olive. They are perhaps some of my favorite colors of any yarn in existence anywhere. I used my very photogenic and willing accomplice…err toddler to model. I love the way the colors look together. I have a lot of leftover yarn too. So, I was thinking of maybe making a hat or something to go with this. Then over the weekend I got some buttons in the mail. These were eagerly anticipated buttons. I have had a sweater ready for them for well over a week and all it needed to be finished were the buttons. This sweater is a kid’s sweater that sort of came about as an accident. I really hadn’t meant to write a pattern for this sweater. I thought I would find one, modify the length and just knit it up striped. Well, I didn’t find one that would work in sport/dk weight, with not too much ease, and was top down with the buttonbands picked up continually. So, I just decided to write one. Pattern is with test knitters right now. I just adore this little cardigan! I can’t wait to do the photoshoot for it. 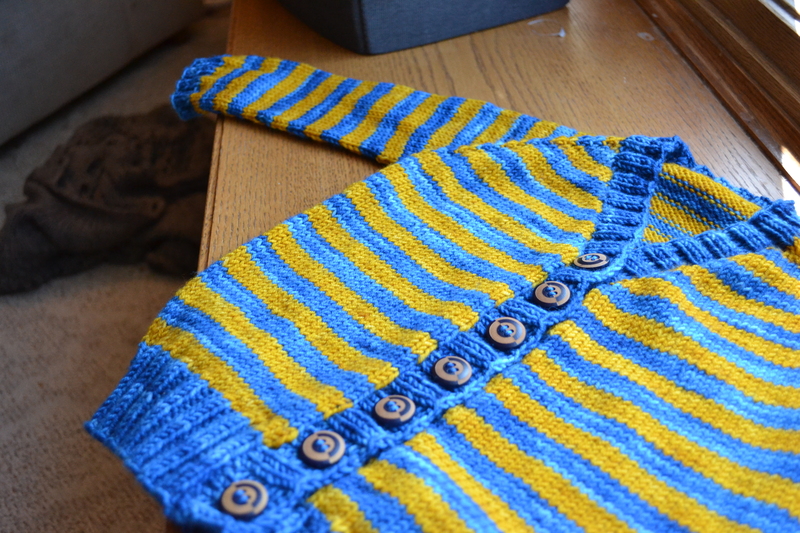 We also have our first finished object photo from the KAL. Knit by javajennie on Ravelry. Take a look at this adorable Boo Hat. Thanks so much for stopping by! There’s still time to come by and join the KAL in my group! New Pattern and Time for a KAL! So, if you’ve been hanging around the pattern section at Ravelry, you may have come across some fantastic new patterns that have come out this week. 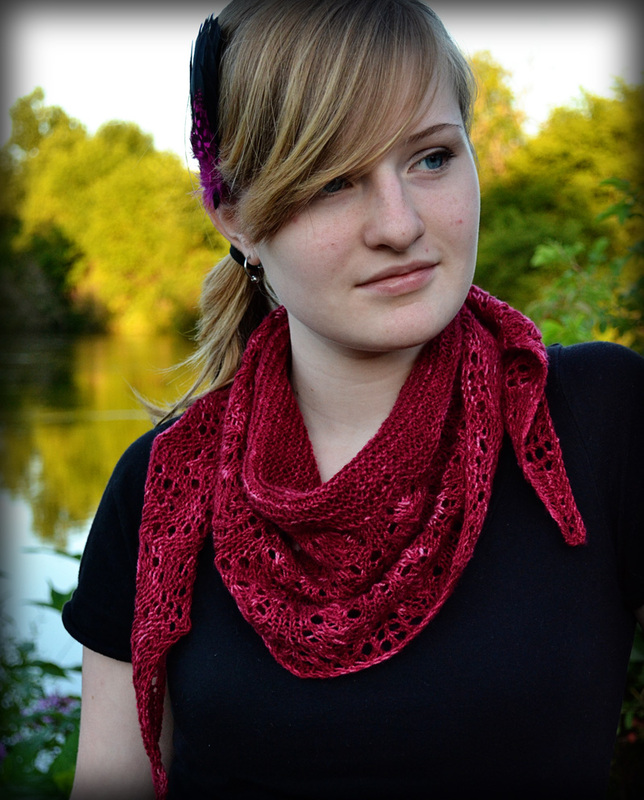 My newest pattern, “Anonymous Vampire,” was among all the lovely new releases. 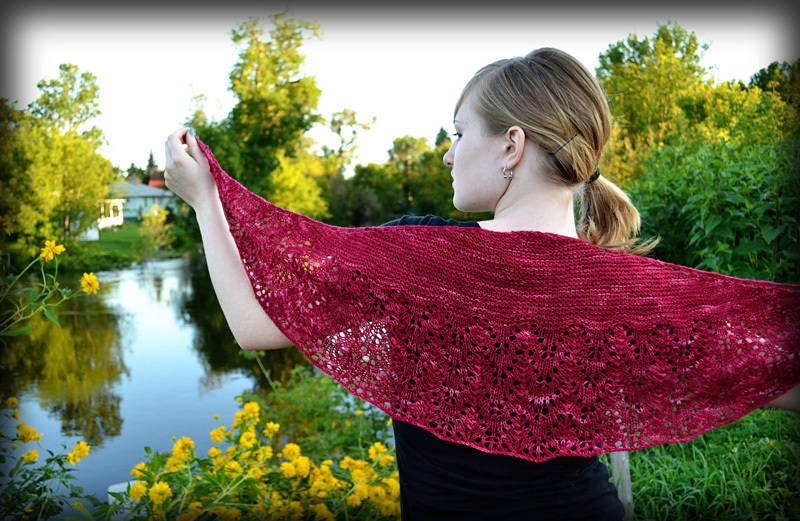 “Anonymous Vampire” is a crescent shaped lace shawlette. Worked from the top down, the shawlette gets it’s shape from the rapid increasing at the edges. The top section is done in garter stitch which transitions into a simple, rhythmic lace pattern. The design comes in two sizes: small and large. The small makes a nice scarf size and the large is more “shawlette” sized. The yarn used in this design is Indigodragonfly Merino Sock, colorway: tiny bloodsucking dancer. The color is magnificent. I absolutely fell in love with this when I saw it. Now, I don’t jump at “red” yarns very often. But, I fell HARD for this one and had to have it immediately. Of course, with a colorway name like, “tiny bloodsucking dancer,” whatever I made with it, had to be vampire themed. See how nicely it would cover up “bites”. I have to preface the rest of this paragraph by saying, I am a HUGE Buffy aficionado. Huge…seriously, huge. Re watching the dvds got me through my 4th pregnancy(that’s a whole different story). The name, “Anonymous Vampire” came from the Buffy website, BuffyGuide.com. They call the random vampires encountered and killed by Buffy and the gang, anonymous vampires. 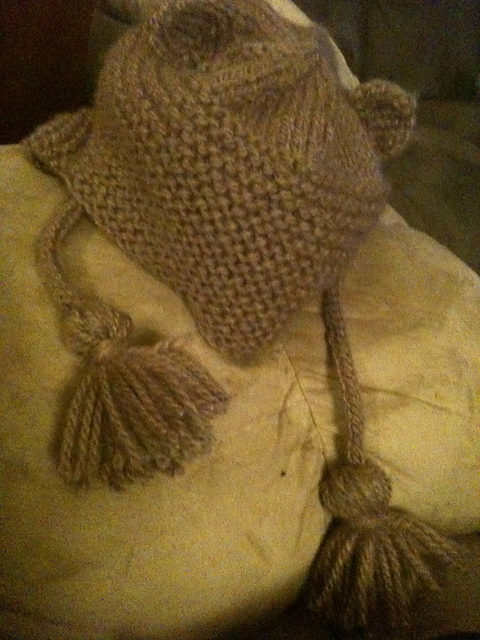 I figured I could use that moniker while knitting and testing this project. I thought I would come up with something better. I didn’t, so I just went with it. I hope you like it. I had fun making it. It was my first foray into lace design. I foresee more in my future. Now, remember that KAL thingy? Itty Bitty Kiddie KAL. Oh yeah that… It starts tomorrow. I still do not have badges for project pages ready. I will attempt that photoshoot tomorrow. Let’s hope the toddler cooperates. Stop by my group at any time and join in the WHOLE month! Remember, it doesn’t have to be a pattern of mine. 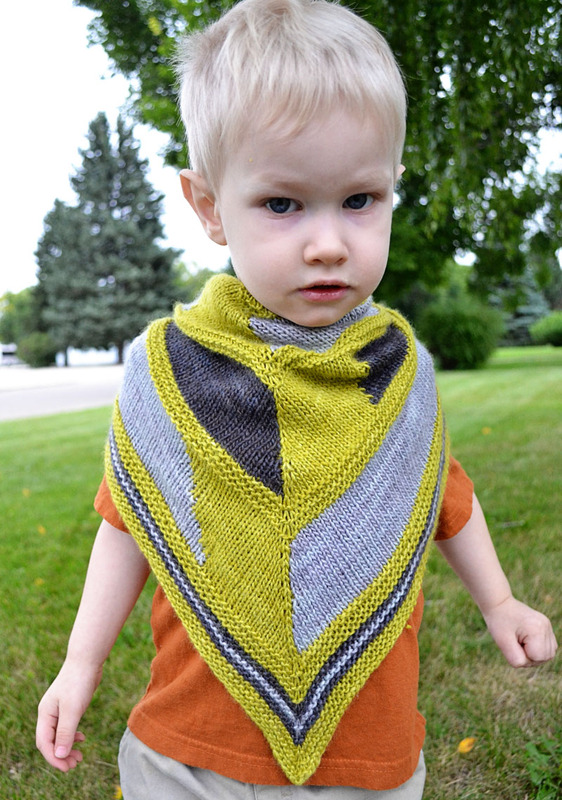 Though, if you would to knit one of my patterns, the kiddie patterns are on sale in my shop until September 15th. No coupon code needed.